Do you have a passion to make a difference & the desire to lead? Public Allies Indianapolis shows young leaders how to turn their passions, unique skills, experiences, & commitment to making a difference in their community into a viable career path. Attend any or all of our four Spring workshops. Registration is now open! Public Allies Indianapolis Celebrates 10 Years! Over 170 Allies have served in Indianapolis over the last 10 years. Save the Date! 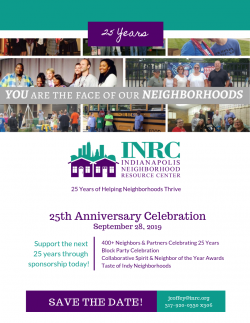 INRC is celebrating 25 years of helping neighborhoods thrive. Join us as we celebrate with over 400 neighbors with an indoor block party, awards, and sharing stories of transformation over the last 25 years! Join us at Neighbor Power Indy on Saturday, March 9, 2019 at Marian University for a day of interactive neighbor-led workshops, neighborhood storytelling, neighborhood recognition and much more!